A variety of water treatment processes require DC power for producing strong electric fields in enclosed containers or water tanks. As DC power is not readily available, these processes rely on DC power supplies, also referred to as rectifiers, as a critical element in the treatment of water to convert available AC to DC. With the power supply outputs connected to the water enclosure's electrodes, control of the power supply is critical to ensure process repeatability and operational safety. Power supply features such as interlock (emergency stop), external start and stop, and reference voltages proportional to output voltage and current enable system-level integration of the power supply with external instrumentation for maximum control. Front panel indicators and extensive diagnostics eases system setup and troubleshooting. Magna-Power Electronics reputation for water-treatment and electrolysis power supplies is built upon its reliable current-fed power processing technology, flexible control, and a wide range of standard models. Ease of PLC Integration: Magna-Power Electronics external programming, consistent across its entire programmable DC power supply product line, allows the product to be easily integrated with external instrumentation. +5 Vdc and +10 Vdc references are provided allowing the use of dry contacts on the digital inputs and jumpering. An interlock signal is also provided on all power supplies, recommended by most EDI module manufacturers. Reputation in water treatment industry: Magna-Power Electronics has a long-standing history in the water treatment industry. 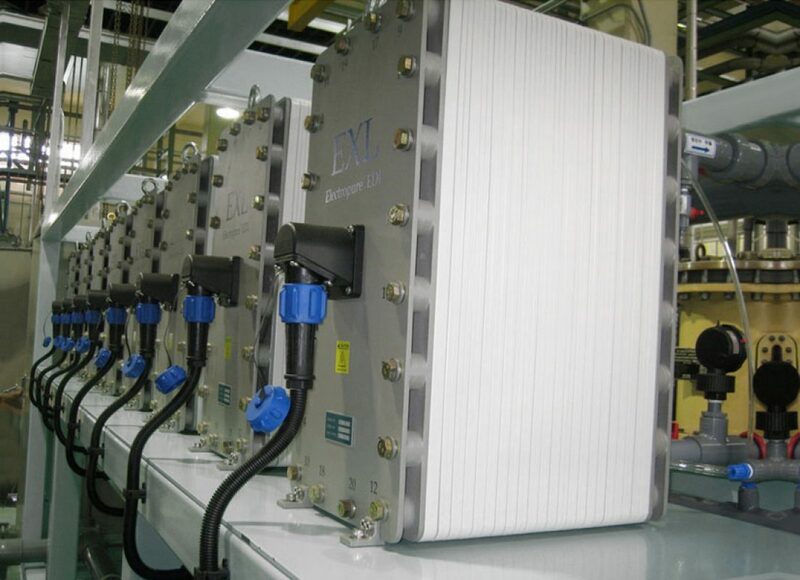 A broad voltage and current model offering directly matches with EDI modules and other water treatment requirements, allowing power supplies to be closely matched to actual power requirements. Water Cooling (+WC) option: A water-cooling option is available for TS Series (5 kW to 45 kW) and MS Series (30 kW to 75) in place of the standard air-cooling. The water cooling is recommended for environments with poor air quality or without adequate air flow necessary for the power supply. Standard products, built for reliability: All Magna-Power Electronics power supplies are built for peak voltage and peak current operation, 24 hours a day, 7 days a week. With thousands of power supplies delivered every year and a product line refined over decades, have confidence in the reliability of Magna-Power Electronics products. Electrodeionization is a chemical-free water-treatment process that uses electrodes to ionize water molecules to separate dissolved ions from the water. EDI is often used in applications requiring ultrapure water, such as pharmaceutical, semiconductor manufacuring, or other industrial processes. A DC power is used in conjunction with electrochemical cell(s) to provide the electricmagnetic field necessary to separate the ionized species from the feed water. The following table relates the rectifier power requirements for Electropure™ EDI modules to the Magna-Power Electronics programmable DC power supplies. For each additional module in parallel, the power supply's current requirement increases by the corresponding amount in the table below, which will cause the best suited power supply to vary. For more information, find your local Magna-Power Electronics sales partner. For larger systems, please contact Magna-Power's sales team. The following table relates the rectifier power requirements for EDI modules to the Magna-Power Electronics programmable DC power supplies. For each additional module in parallel, the power supply's current requirement increases by the corresponding amount in the table below, which will cause the best suited power supply to vary. For more information, find your local Magna-Power Electronics sales partner.